The development comprises 40 one, two and three-bedroom apartments and penthouses in two separate buildings, the new Southwark scheme is creating a stylish option for urban living in this exciting Zone One location. Located near the ‘Blackfriars Mile’, residents of The Chroma Buildings will benefit from the mile-long regeneration of high quality public realm connecting the river with the Elephant and Castle, which is delivering newly designed public space, a menu of world class eateries, cool cafes and shops, as well as providing the gateway between Southwark’s historic colour and charm, and the reborn Elephant and Castle. Reflecting Southwark’s status as London’s most architecturally progressive borough, Alan Camp architects have designed The Lumiere Building and The Zeiss Building to evoke the photographic heritage of the former Colorama site, where warehouses dated back to the Victorian era. Each apartment – irrespective of size - enjoys a different, yet intelligently configured floorplan, reflecting the creativity that inspired the original design. Thoughtfully arranged, open-plan kitchen / dining areas offer flexible internal space, while bespoke units with glass splashbacks, streamlined cabinets and stone worktops create a stylish environment for home entertaining. Living areas are characterised by bespoke joinery and timber flooring, which creates a sleek finish that appeals to urbanites, while full height windows maximise the influx of light and capture the city views. Master bedrooms provide a sanctuary from the fast pace of city life, with luxurious carpeting and bespoke fitted wardrobes. Hotel-style bathrooms and ensuites enjoy floor to ceiling tiles with dark wood cabinetry for an opulent finish. 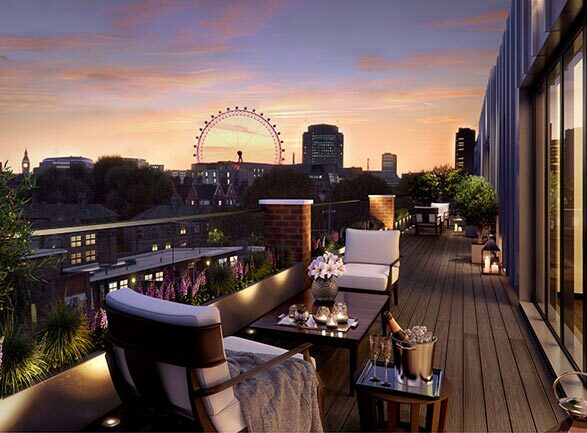 Each residence has a balcony, while a residents' only urban roof terrace provides views over this exciting area as well as private outdoor space in the heart of the capital. The scheme offers a high level of security with a video entry system and CCTV, as well as allocated bicycle storage for every apartment. The scheme’s central location is walking distance from many of London’s attractions, including The Globe Theatre, Royal Festival Hall, Borough Market and the Shard, as well as the city’s constantly evolving, avant-garde cultural scene. Exceptionally convenient for commuters, residents are around a ten-minute walk from Southwark, Borough and Waterloo tube and train stations. “Southwark, London’s oldest borough, is experiencing an exciting period of architectural innovation that is no longer exclusive to the riverside. Creative design, coupled with a new urban vision for Southwark, is driving the regeneration of previously disused commercial sites into thriving, residential centres. “Blackfriars Mile is a landmark project for SE1, which will enhance the area’s status as a desirable leisure and residential destination. Neighbouring Southbank Quarter, with its diversity, character and buzz, offers residents the necessary infrastructure for an established lifestyle on their doorstep.